But if one class is good, stands to reason two or even three must be better. So you sign up for an art class, craft lessons and a quilt making course. You also try and whip the garden into shape and do a spot of home decorating. Life gets… hectic. Oh, and didn’t I say? There’s homework. You do your best, but an unfinished pastel drawing of a hare spawns a fantasy tale of a fairy lost in an underground warren. A patchwork pincushion is ditched in favour of a story featuring a dying woman’s repressed memories. A tie-dye scarf ignites a murderous strangling, and the baby’s cot quilt raises the spectre of a ghost-child. The courses gradually peter out until you’re down to one, the writer’s. This one has you hooked. This one you can’t give up. You progress from short descriptive pieces, to actual 3,000 word stories. You dream of one day, some day, writing a novel. Day dawns when you wake with a character in mind, and write your very first line. You attend Saturday lectures run by Cardiff University, where published authors actually talk, give tips, offer help. One asks a first page submission from the class, and chooses yours to read aloud. A real writer actually says that your first page has the hook. The novel steams along, and when it’s done you give it to an English teacher friend. You redraft, and redraft, then hide the manuscript in a drawer. Perhaps like a photograph in developer it will magically become the story in your mind. Evening classes present a range of tutors, each with a different slant on the writing process. You learn the art of paring down, cutting redundancies, boiling off modifiers to leave the sarn, the essence. Sarn – my grandmother’s word for the delicious meat jelly found beneath a layer of dripping. You return to the novel and start cutting. The writer’s lot – rewrites, rewrites, rewrites. Novel done and sent into the world, you are faced with emptiness. Depression sets in. You’ll never write another line. No more stories… no more words. One day a word does come, dropping into your mind like a pebble in a pond. Where did it come from? A song, a line of TV dialogue or taken from a misheard scramble spoken on a bus? However it comes, it causes ripples, makes your mind itch. You take a walk to test its staying power. It’s still there when you get home. The word likes you. But one lone word is useless. Where’s its friends? One frabjous morning the word is nesting in the middle of a whole sentence, which grows into an actual paragraph, then a full page. The picture grows, a story comes to life. It’s like when you see a colour chart in Wickes and get a flash of your dingy living room decked in brand spanking new colours. You rush to get that story down, up at five and late to bed. Ah, and then come the tweaks, the rereads, that chase for elusive perfection. Rewrites, don’t you just love ‘em? Jane Hicks writes adult and young adult fiction, novels and short stories. She took second and third prizes in the recent Words with Jam First Page Competition, wowing the judge with her wit, inventiveness and unique style. 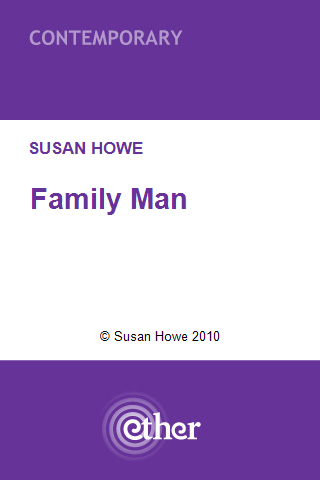 Family Man, my short story about a couple’s struggle to start a family – and its consequences – is now available to download from Ether Books. I hope you enjoy it! I’m honoured and delighted to be Ether Books featured Writer of the Week. Please visit Ether’s blog for an interview with yours truly. I’ve also just heard Ether will be publishing another short story of mine, Family Man, later this week. You can find instructions for downloading the Ether App here. It’s a great start to the week! I’ve long frequented writing forums and message boards, exchanging niceties with other write rs, critiquing and being critiqued in return, listening to other people’s tales of sorrow and success … laughed aloud at some of the first class wit that easily lives up to Friday Night with Jonathan Ross (god, but I’m glad he’s back on, even if I do have to fast forward the ads). Over a couple of years the suggestion that some of the more humorous contributors to the forums should start blogs or write books full of their anecdotes became frequent, and if I’m honest that’s when I had the idea of starting some sort of magazine for writers by writers. I might correct that in a later article, editor’s note or blog post, so please don’t quote me, but looking back now I’m sure that’s where the concept first took hold. That and the fact that a lot of other literary magazines are (quite rightly) all about the literature. I enjoyed the ‘fun’ aspect of message boards, and I wanted to carry that through into a format that could be enjoyed by a readership far greater than the members of a particular site. Some of these writers deserved to be read, and the writing world at large deserved to share the laughs. So with a bit of begging, borrowing and a huge amount of generous input (so generous I’m still astonished and delighted by it) that in December 2009 we released the first issue of Words with JAM for public consumption – a mere 80 readers. Once out there, the word soon spread, and within a week or so of its release, the issue had a few hundred readers. It was our mix of humour and irreverence as well as serious guidance and opinion that appealed most to our readers. Oh, and we were free. I suppose that helped. Running the magazine since then has, in fairness, been relatively easy and pain free. There’s a great team of people who commit a lot of time and energy to each issue. They all write informative, witty, funny, useful, resourceful articles each issue, and they all seem, even after two years, as excited about the magazine as they were when we released our first issue – more so. It’s the enthusiasm of the team and not just the readership, together with professionalism and supply of brilliant content that keeps the magazine going. There is no shortage of published authors willing to participate in interviews, dedicate their time for articles, or let us have freebies to give away to readers either. And alongside the big names we commit to featuring both unknown and up-and-coming writers, plus we have our regular columnists, satirical magazine items like horoscopes and reader letters, writing exercises from OU tutors, and the latest on the UK’s library closures, so there’s a great balance that readers won’t tire of. We do need to keep feeding our readership and pushing our online presence, so we run various competitions including an annual Short Story Competition and our most recent in which a reader can win a £500 Cornerstones General Critique – it’s even free to enter! And articles from back issues are currently being uploaded to our blog. Having worked as a graphic designer for over ten years, I knew an important aspect of the magazine would be a good, clean layout, enticing people to read and make us appear professional. It’s not easy, getting the layout done in such a short space of time. Between deadline and sending files to print (yes, we have a print version of the magazine now too), there’s around a week to get everything set, proofread, and ready to go. But it’s been worth getting it right. I won’t speak for the rest of the team, but I was extremely concerned after featuring Jo’s interview that we’d peaked, reaching a point where we’d plateau or have to finish on a high. Instead, it seemed the interview moved us up a notch in the eyes of the literary world. We were no longer just a free magazine by a bunch of wannabes. We had a serious readership and we were getting noticed. These days I have to turn down a lot of articles and fiction. It’s not my favourite part of the Editor’s role, but we have 56 pages and only 56 pages (and yes they are only A4 sized), so we can’t cram everything in, even though we try. I’d say the best part of running the magazine is the rush after pressing the ‘send’ button on launch night. The whole world turns eerily quiet, like when you’re hosting a party: The food is on the table, you’ve Dysoned all the cobwebs off the ceiling and wiped your son’s pee off the toilet seat, and all that’s left is to wait for the guests’ arrival whilst nervously downing your third glass of red. That’s how I feel after the ‘send’ button has been pressed and I’m alternately checking Facebook, the mailing system’s stats page, and my Editor’s Inbox for the first sign of receipt. 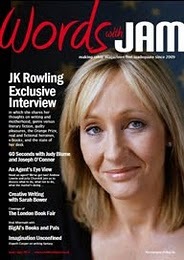 As I type, the October 2011 issue featuring an interview with Jasper Fforde is being proofread. We’ll also be announcing our December cover star that is guaranteed to cause a stir as big as JK. We get a bit excited on launch night, so why not join us at the beginning of October for our live (and not particularly sober) Facebook countdown. JD Smith is a Graphic Designer and Editor of the literary magazine, Words with JAM. She lives and works in the English Lake District where she spends much of her time reading historical fiction and inventing projects to avoid actually writing. Two more of my twitter-length tales were published by Folded Word on 15th and 17th September. The theme is ‘Exit’. I’ll get rid of them all eventually! 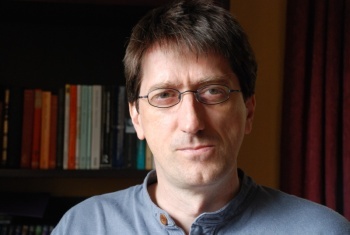 My Friday Guest is Simon Kewin, prolific author, software expert and all-round nice guy. The other day I was explaining to a friend what sort of fiction I write. Dear reader, I knew what he meant although, naturally, I didn’t agree with his description. But it’s an attitude I encounter a lot and it’s one that has always puzzled me. I’m of the opinion that there are precisely two sorts of music: good and bad. Same with writing. I know people who never read fantasy “because it’s not real”. I even know people who never read fiction of any sort, for the same reason. Each to their own and all that – I don’t read many westerns myself – but why limit yourself? The truth is, I don’t like the notion of genre and I’m not even particularly convinced genres exist. So many books blur the lines. Literary classics like Dorian Gray and Midnight’s Children are clearly fantastical. The writing of, say, Ursula Le Guin, is clearly highly literary. Is Pride and Prejudice a romance? A comedy? A thriller? Who cares? I think writers can and should just write stories and not worry about these categories. I worry that all this leads us into writing formulaic fiction : the equivalent of lowest common denominator chart music, stripped of all verve and originality. If we only want to write pure high-fantasy with dwarven lords mistrustfully eyeing elven emissaries, then fair enough. If we only want to write bittersweet tales of life in modern Britain, then fair enough again. But why are we so discouraged from writing both if we wish to? Maybe even at the same time? Why not write stories that slip between the cracks and do something unexpected? Why the divisions, the camps, the separate prizes and the book-shop ghettos? Writers of mainstream fiction are, in my experience, often surprised at the number of short fiction markets out there for “genre” stories. Seriously, there’s a lot. Well worth investigating. When it comes to novels, though, it’s the other way round : most agents and publishers, in my experience, prefer to see only realist work (sometimes they say “literary” but it’s pretty clear they wouldn’t want to see a literary SF novel, say). I’m not saying all literature should be a genre-spanning mash-up. If a someone wants to spend their life writing zombie apocalypse sagas, then good luck to them. But what I am saying is that, when it comes down to it, there are really only two sorts of fiction. The good and the bad. You can find Simon in the Herefordshire sticks or on his website or blog. Okay, so let’s talk about publishing. Not any old publishing, but e-publishing – or should that be epublishing, or epub, or… whatever! Anyway, if you hadn’t noticed there’s a revolution afoot Comrades. No, I’m not talking about Syria, Tripoli, or any of the other faraway hot places where camels strut their stuff and there’s lots of sand – and we’re not talking about the few measly grains on the beach at Blackpool either! Oh yeah, a revolution! It’s been the talk of the radio waves – or should that be satellite waves, or maybe wireless, or…? Now, you’re probably thinking, He keeps wandering away from the subject! Well, that’s what I do. I mean, it’s no good making assumptions, skipping over fluffy stuff you don’t understand, or shilly-shallying around the more difficult concepts. Anyway, e-publishing has become a phenomenon – I love that word, especially when you say it slowly and wrap your lips around it. Before, when brontosaurs roamed the Earth masquerading as traditional publishers, fed by their minions – agentosaurs – there were gatekeepers. For those of you unfamiliar with gatekeeper theory, these were people who decided which deserving author was published, and of course, which were not based on some slushpile criteria that was kept super secret. Then, these monstrous gatekeepers sent you a photocopied letter saying nothing of any value. But now, every writer is a deserving author. Now, you can e-publish anything and everything within 24 hours. Some of you are thinking, Yeah, some of it shouldn’t see the light of day! Well look, you know that and I know that, but now it’s the readers who decide not those heinous gatekeepers who dismissed your drivel on a whim. Now, strangers who buy your offering will tell you whether it was worth publishing or not. If you haven’t developed a hide like a rhinoceros, now would be a good time to begin working on that. Sometimes though, a complete stranger – with no axe to grind – will give you a five-star review, say that they love your writing style, your plotting, your characters, and have you got anything else please? They email you, friend you on Facebook, follow your Blog and on Twitter, Like your fan page, and generally give stalking a bad name, but it makes the hours of writing all worthwhile. You’re an author and those gatekeepers were wrong, and now they’re knocking on your door wanting a share of your profits – What are you gonna do? So, all’s well with the world, and what’s scarier is that everybody who e-publishes is an agent, a marketing guru, an accountant (always supposing you’re getting some sales), a cover design artist, a blurb writer, a tech-savvy all-singing all-dancing self-publishing Mr or Mrs Wonderful. You get to pull the strings, control everything, decide on everything – oh, there are market forces, which dictate certain things, but all in all you’re the man/woman. The buck stops with you, and now you have no time for writing. Bah humbug you say – you didn’t want to be a writer anyway, did you? Visit Tim’s website or his Amazon Author Page for more details about his work.